﻿I was told that Slots.lv Casino is one of the online casinos that are open to US players. Hence, I decided to give it a chance and try some of the blackjack games offered by the casino. The operating company of Slots.lv Casino is Lynton Limited and the gambling license this casino holds was issued by Kahnawake Gambling Commission. The Casino is restricted in the following US states: New Jersey and Maryland. Slots.lv Casino was launched in 2013 and, even though it is new in the business, I must say that it offers many benefits to its customers. There were several blackjack games, numerous slots by various software providers, good 24/7 customer support service and reliable US-friendly banking options. Additionally, I was very sa﻿tisfied with the mobile application that allowed me to play blackjack anywhere, anytime. 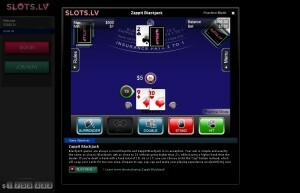 All of the blackjack games at Slots.lv Casino are powered by Realtime Gaming. In my opinion, there are enough blackjack variants that can keep blackjack players entertained for a long time. However, there are also casinos that offer over 20 blackjack games, so the seven games at Slots.lv Casino may not be enough for some players. Instant play and download software were the options I had before I could start playing for real money or practice mode. I liked the blackjack page where users can find the general rules and payouts about the game. In any case, these were the blackjack variants at Slots.lv Casino: Blackjack, Blackjack Perfect Pairs, European Blackjack, Face Up 21, Zappit Blackjack, Single Deck Blackjack and Double Deck Blackjack. I think it is always good to have at least three blackjack games, Classic Blackjack excluded, in order to keep things interesting and fresh. That is why I was satisfied with what I found at Slots.lv Casino. The table limits at most blackjack tables were $1-500. Slots.lv Casino is powered by Realtime Gaming; nevertheless, I was able to play some of the popular games developed by BetSoft and Customized Games Limited. Neatly organised in five main categories, there were 15 table games, 92 slots, 17 video poker, 55 progressives and 6 specialty games. Being able to play over 100 high quality games, spiced up with 3D effects and amazing sounds, always makes me happy. In the extensive slot games selection I found Greedy Goblins, Good Girl Bad Girl, A Night in Paris, At the Copa and many other cool slots. Some of the table games, beside the blackjack variants were European Roulette, Craps and Caribbean Hold’em Poker. Finally, at Slots.lv Casino players can relax with a quick gaming session of Keno, Virtual RaceBook 3D or Skratcherz. I think that every casino should show love and respect towards its blackjack players by launching special promotions for them. Slots.lv Casino surprised me with the amazing table game bonuses that can earn a player up to $1,000. Users who make a deposit of at least $500 can use the bonus code HELLOGAMES and receive 100% match bonus up to $500. The bonus code can be used only twice, which means the maximum table game bonus per player is $1,000. The bonus and deposit amount had to be played through at least 40 times before requesting a withdrawal. Slots.lv Casino has an awesome welcome offer of ten match bonuses up to $500 each. Sounds incredible, but I could get additional $5,000 simply by making deposits and using the bonus code HELLOSLOTS. Every deposit is rewarded with a 100% match bonus up to $500 and the minimum wagering requirements are 25 times the deposit + bonus amount. I was sad because this welcome offer is tailored only for slot games; however, the table bonus that I mentioned before was enough to keep me satisfied. Those who like playing on their tablets and smart phones will be surprised by the mobile bonus offered at Slots.lv Casino. Right after I made a deposit of $100 via my mobile device I received $10 free cash so I can continue playing some of the awesome mobile games at Slots.lv Casino. If you fancy another free $10, just like and share their Facebook page and send them your account number and they’ll ship you another freebie! 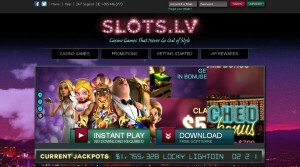 I really liked Slots.lv Mobile Casino. It is very simple to access and all I had to do was to enter the address http://m.slots.lv into my browser and log in with my Slots.lv Casino username and password. Of course, the game selection at the mobile casino was smaller; nevertheless, I was able to play some popular slots such as After Night Falls and At the Copa as well as enjoy a good game session of Blackjack. According to the information I found on the site, customers can visit Slots.lv Mobile Casino using iPhone 3, iPads, tablets and Android smart phones. The mobile casino has the same background and ornaments as the regular online Slots.lv Casino. 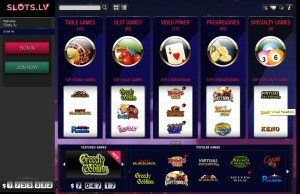 Slots.lv Casino accepts various payment and withdrawal methods. Good news to fellow US players is that they have more than one banking option at this casino. Unlike many other casinos that offer only one payment and withdrawal method, I think being able to choose between five different payment options is really great. Besides Visa credit and debit cards, which I was able to use as deposit methods only, I had to choice to transfer money via person-to-person Money Transfer, Rapid Transfer, Western Union and MoneyGram. Visa deposits have to be at least $20, whereas all the other methods require minimum deposit amounts of $100. Except for credit/debit cards, the other methods can be used for cashing out too; the minimum withdrawal amount is $100. There are certain withdrawal fees that vary from $20 to $100, depending on the cashout amount. There’s also a range of deposit/withdrawal methods exclusively for Canadian players, so be sure to check that out too.